Cadillac Racing, which led every session through the first two days of the Roar Before The Rolex 24 At Daytona test, carried its strong showing into Sunday’s inaugural Roar qualifying session. The new-for-2018 format established garage and pit locations each team will use during the Rolex 24 At Daytona race weekend on Jan. 25-28 at Daytona International Speedway. Leading the way in a 15-minute session for the IMSA WeatherTech SportsCar Championship Prototype class was Brazilian Felipe Nasr. Driver of the No. 31 Whelen Engineering Cadillac DPi-V.R, Nasr toured the 3.56-mile/5.73-kilometer layout utilizing portions of the NASCAR trioval and infield road-course with a best time of 1-minute, 35.806-seconds/133.764 mph. Nasr was first among a top-four sweep for Cadillac, which is chasing its second consecutive Rolex 24 win after taking its debut race last year. “All I have to say is, we as a team _ Action Express and Cadillac _ we brought the car out there to run the most amount of laps,” Nasr said. “We were really getting into it and preparing for the race, because we know this weekend is more a part of what is going to come at the end of the month. We all felt pretty confident. We felt the car was behaving well. The Rolex 24 put Nasr on the map somewhat when he earned a ride in the 2012 race as winner of what was then the “Sunoco Rolex 24 At Daytona Challenge” by taking the 2011 British Formula 3 title. His performance in that race, which netted a third-place result, was impressive and paved the way for a career that ultimately took Nasr into Formula One. This year, Nasr will race fulltime in the WeatherTech Championship alongside 2016 Prototype champion Eric Curran in the No. 31 Caddy. For the Rolex 24, they welcome Englishman Mike Conway and this year’s Sunoco Whelen Challenge winner, Stuart Middleton, who is following in Nasr’s footsteps. “There’s so many other things I got to experience here in a positive way _ the racing, the people _ it really opened up the doors for me here,” Nasr said. “I became friends since then with everyone. I knew with a phone call to my American friends that I could be coming back to the race and that’s what I thought early-on. As soon as I had a brief adventure in F1, let’s put it this way, I had great fun, but I knew this championship was always going to go up. Second-quickest in Prototype qualifying was Tristan Vautier in the No. 90 Spirit of Daytona Racing Cadillac DPi-V.R with a time of 1:36.037/133.442 mph. While the team has participated for several years in the WeatherTech Championship Prototype class, it is a newcomer to the Cadillac/General Motors camp in 2018 after fielding LMP2 cars last year. Vautier is sharing the car with full-season teammate Matt McMurry and endurance driver Eddie Cheever III. Albuquerque was third in the No. 5 Mustang Sampling Cadillac he shares with Joao Barbosa and Christian Fittipaldi, posting a best lap of 1:36.135/133.306 mph. Renger van der Zande was fourth at 1:36.481/132.828 mph in the No. 10 Konica Minolta Cadillac, co-driving with past Verizon IndyCar Series champion and Indy 500 winner Ryan Hunter-Reay of Andretti Autosport, and reigning race and series champion Jordan Taylor. Dane Cameron rounded-out the top five in the series debut of the No. 6 Acura Team Penske Acura ARX-05 DPi entry. Cameron’s best lap was a 1:36.988/132.188 mph in the car he shares with two-time Indy 500 champion Juan Pablo Montoya of Colombia and Frenchman Simon Pagenaud, the Verizon IndyCar Series champion in 2016. 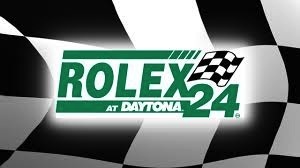 Joey Hand, Dirk Mueller and Sebastien Bourdais will vie for their second consecutive Rolex 24 At Daytona victory for Ford Chip Ganassi Racing in the No. 66 Ford GT. Their title defense got off to a strong start at the Roar, as Hand was fastest qualifier in the GT Le Mans (GTLM) class with a best lap of 1:43.610/123.688 mph. “You’re always trying to win practice, but especially trying to win qualifying,” Hand said. “We went for it. We struggled with our balance of the car a little bit from the December test. We really liked it. Dirk and Seabass (Bourdais) and I were just bouncing it all weekend. We got it closer this morning, we think maybe it’s the temperature, and we made a change right between the practice and qualifying. Oliver Gavin posted the second-quickest time in GTLM, turning a 1:43.640/123.653 mph lap in the No. 4 Corvette Racing Chevrolet Corvette C7.R he’s sharing with Tommy Milner and Marcel Fassler. Ryan Briscoe was third in the No. 67 Ford GT at 1:43.714/123.564 mph, followed by Earl Bamber in the No. 912 Porsche GT Team Porsche 911 RSR at 1:43.888/123.357 mph and defending WeatherTech Championship GTLM champion Antonio Garcia at 1:43.998/123.227 mph. The top six GTLM cars qualified within one second of each other. Lamborghini Huracán GT3s have been at or near the top of the time charts throughout the Roar Before the Rolex 24. Included was the class’ fastest overall lap of the weekend of 1:47.104/119.653 mph set in Friday’s first session by Rolf Ineichen in the No. 11 GRT Grasser Racing Team entry. It was more of the same in Sunday’s qualifying session during which Ineichen’s teammate, Mirko Bortolotti, posted the fastest time of 1:47.374/119.352 mph, securing prime garage space and pit selections for the No. 11 team that includes drivers Franck Perera and Rik Breukers. “It’s good to be back at Daytona,” Bortolotti said. “We are not a regular team for the season, but for me, it’s already the third time coming back to Daytona, so it’s always good to be here. For the team, it’s the second time after the race we did last year. We’ve got a good garage spot for the race. Let’s see what kind of benefit we will have out of it. Andy Lally qualified second in GTD in his return to the No. 44 Magnus Racing Audi R8 LMS GT3 after spending the 2017 WeatherTech Championship season with Michael Shank Racing’s Acura NSX program. Lally posted a best time of 1:47.436/119.284 mph in the car he shares with owner/driver John Potter, endurance teammate Andrew Davis and Audi factory ace Markus Winkelhock. Patrick Long was third in GTD at 1:47.481/119.234 mph in the No. 58 Wright Motorsports Porsche 911 GT3 R. This lineup includes two-time and defending WeatherTech Championship GTD champion Christina Nielsen, along with Robert Renauer and Mathieu Jaminet. Alvaro Parente was fourth in the No. 86 Michael Shank Racing with Curb-Agajanian Acura NSX GT3 at 1:47.605/119.096 mph, followed by Ryan Eversley in the No. 69 HART Acura NSX at 1:47.665/119.030 mph. The top 18 cars in GTD _ all but one of the 19 to participate in the qualifying session _ were covered by less than one second.